Mannat (Reprise) Lyrics from Daawat-e-Ishq(2014):This the reprise version of original Mannat song sung by Shreya Ghoshal, Sonu Nigam ,lyrics given by Kausar Munir and composed by Sajid-Wajid. 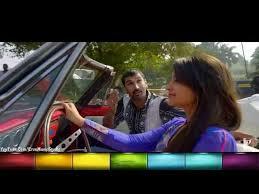 Meri mannat tu.. meri mannat tu..
Jaadu Tone Waaliyan Lyrics from Daawat-e-Ishq(2014): The song is sung by Shabab Sabri, composed by Sajid-Wajid while Jadu Tone Waliyan Lyrics are penned by Kausar Munir. 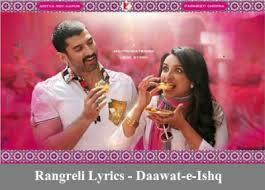 Shayarana, shayarana sha ra ra ra shayarana..
Pa pa pa para aa ee..
Rangreli Lyrics from Daawat-e-Ishq(2014): The Movie is based on love and food.The song is sung by Wajid & Shreya Ghoshal, compsoed by Sajid-Wajid with lyrics penned by Kausar Munir. Meri Mannat Tu Lyrics from Daawat-e-Ishq: A song beautifully rendered by Sonu Nigam, Shreya Ghoshal & Keerthi Sagathia with music composed by Sajid-Wajid while Mannat lyrics are penned by Kausar Munir. 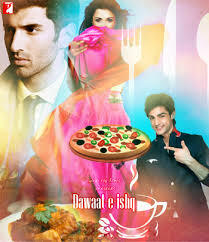 Daawat-e-Ishq Title Song Lyrics(2014): This is title track of Parineeti Chopra & Aditya Roy Kapoor starrer Daawat-E-Ishq.The song is a Qawwali which is sung by Pakistani singer Javed Ali & Sunidhi Chauhan.